Watercolor is an old painting medium. Early man used pigments to paint on cave walls when recording events and records. Watercolor was also used for fresco painting on wet plaster and to illuminate illustrations on manuscripts. But watercolor, as we know it, emerged in the late 15th century with landscape paintings by Albrecht Durer. He used water-soluble paints on paper and allowed the white of the paper to show through. Forerunners of true watercolors again appeared in the 17th century when pen or brush and wash techniques were used. Watercolor was used to record representations of places visited when traveling. It wasn’t until the mid to late 18th century that watercolor became the preferred medium by a number of British artists such as Paul and Thomas Sandby. Until the late 18th century, watercolor was merely used as a sketch or study for oil paintings or as a method to color drawings. At this time, artists, such as J.M.W. Turner and Thomas Girtin, started using new pigments and experimenting with wet-into-wet techniques, scratching, scrubbing off, and moving paint around with water on the paper. 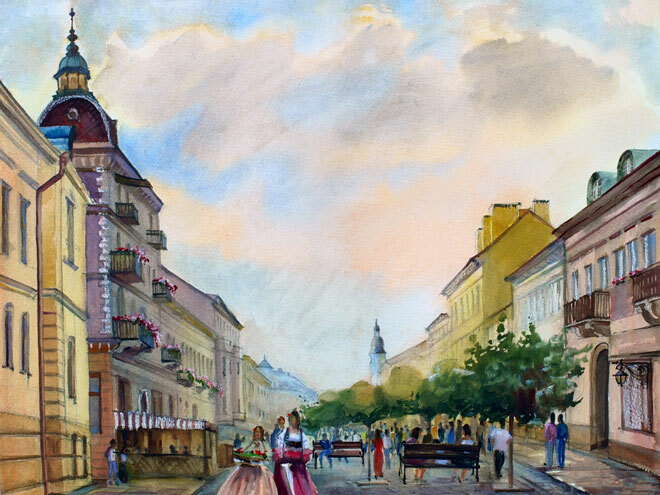 Watercolor paintings became a recognized form of art. Other important watercolor artists of that time were John Cotman, John Constable, Samuel Palmer, and Paul Cezanne. During the 20th century, attitudes toward watercolor were influenced by a Munich group of artists that included Wassily Kandinsky, August Mache, Franz Marc, and Paul Klee. Abstract work joined the pictorially accurate paintings. Winslow Homer, John Singer Sargent, and Edward Hopper developed an American style of watercolor. John James Audubon used watercolors to produce his famed wildlife paintings. Another impressive watercolor artist of the time was Emil Nolde. Other notable artists, Georgia O’Keeffe and Andrew Wyeth, used watercolor to create their paintings. Andrew Wyeth primarily painted the rocky coast of Maine, often using shades of gray and brown. Georgia O’Keefe vividly portrayed nature in magnified form. Even today, many botanical paintings and field guides are illustrated with watercolor. Watercolor societies have promoted watercolor in America since the late 1800s. With the development of a variety of papers, new chemical pigments, and a host of brushes and accessories, watercolor has become a major medium for contemporary artists. The USA currently leads the watercolor scene. William Biggers is a portrait artist. He has an interesting watercolor history page.